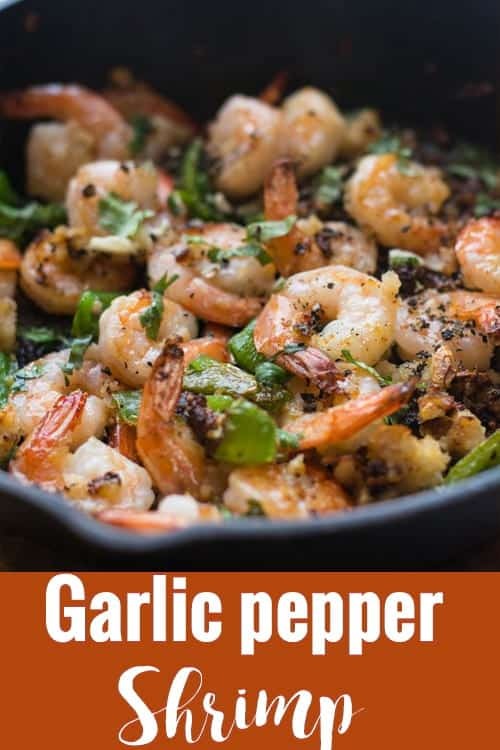 Garlic pepper shrimp recipe can be made in 15 minutes with lesser ingredients. Perfect for dinners and can also be served as appetizers. Very flavourful and tasty dish would be loved by everyone. I know how the evenings are shorter for the busy moms. Dropping the kids for the classes, assisting them in their home works, shopping. Do we ever have time for cooking for the dinner in the evenings? Most of the time, we try to manage the dinner with leftovers and simple food. Reheating the leftovers may save time but would it really healthy? That’s a million dollar question. So, I’m just on a quest for making restaurant style dinner with lesser work and with minimal ingredients. Everyone is talking about restaurant-style dinners. When we call it as a restaurant style food, it should have visual appeal and tastier than everyday food. 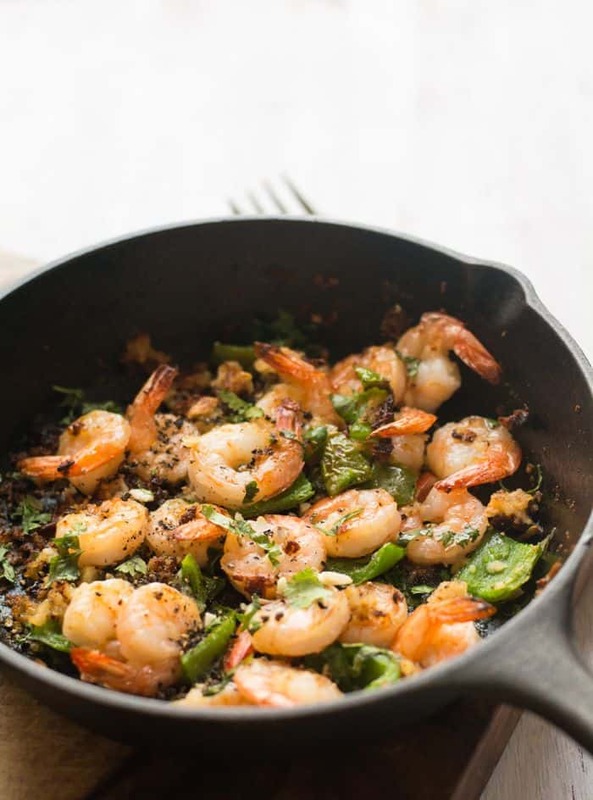 This Galic pepper shrimp is one such recipe, which looks good to the eyes and tastier. And great for moms that these can be made in lesser time. The best side dishes that can be served along with this recipe are Balsamic Green Bean, Cranberry Salad, Strawberry Salad. Stores carry two varieties of shrimps, cooked and raw. 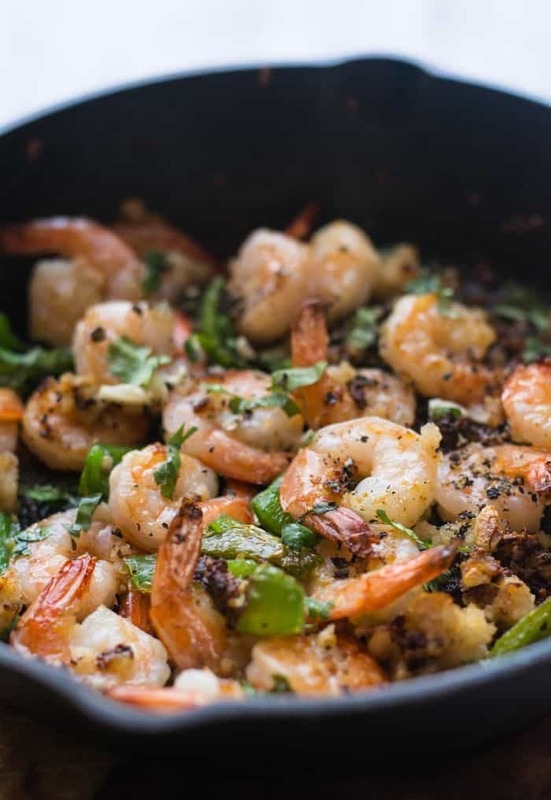 Choose raw shrimps for this recipe. The tail on or tail off shrimps? It’s up to you to the individual’s preference. Both do taste equally good. The tail on shrimps looks dramatic while serving. Overcooked shrimps turn rubbery. Cook in low-medium flame for perfectly cooked shrimps. To make it more colorful, add red peppers. And to make more healthy add broccoli and other vegetables. For the breadcrumbs, I always go with panko breadcrumbs as they do not absorb much oil and they stay crispier for a longer time. The leftovers shrimp can be used for making rolls or sushi. I make the shrimps with more quantity to use the leftovers for making Vietnamese spring roll or sushi. So the same appetizer goes into the main course. 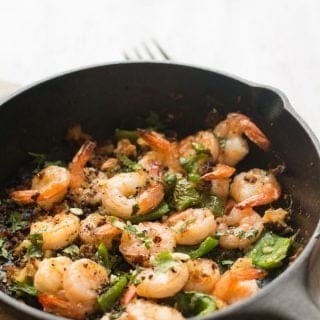 Garlic pepper shrimp recipe, made spicy with black and green pepper in 15 minutes. This stir-fry is best to serve with pasta or brown rice. Perfect dish for healthy weekday dinners. Heat a pan in low-medium flame. Add cleaned, deveined shrimp. Followed by butter, chopped garlic, bread crumbs, green pepper, and salt. Stir for a second. Cover and cook it for about 10 minutes in simmer flame. Remove the lid and in medium flame, cook until breadcrumbs crispy and shrimps cooked perfectly. Add ground pepper and Serve hot.